When young David offered to fight the giant Goliath he said to King Saul that he was always able to protect his sheep by fighting lions and bears. He said that he caught the lion by its beard and struck and killed it. David trusted his God to deliver him from the paw of the lion and knew that he would also deliver him from the hand of Goliath. Lions are the only cats that live in social groups. A group is called a pride. 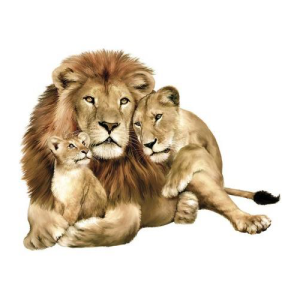 They have usually two males and lots of lionesses and cubs, up to 30 or 40 animals. Lions have manes to protect their neck when fighting and to make them look bigger to their enemies. A male lion’s roar can be heard up to 8 kilometres away. A lion’s eyesight is 5 times better than ours and it can hear prey that is more than a mile away. They also have a very good sense of smell and can tell if prey is near and how long it has been around. Every animal can teach us something about ourselves, something about the good in us and something about how we can get it wrong. The body of a lion is very strong and powerful, they are very courageous animals but they only ever attack for food or protection of their family. Sometimes we too have to be as brave as a lion. Bad lions are like the bad thoughts that can try and take over our life, like being angry or wanting to hurt someone else. Then we need to fight the lion in us. Samson was very strong and he had never cut his hair, which was where all his strength was. He wanted to marry a young woman. On the way to see her he was attacked by a young lion. Samson was given strength from God and fought and killed the lion with his bare hands. They could not solve the riddle on their own and if you want to read what happened in this exciting story it is in the Bible in Judges chapter 14. 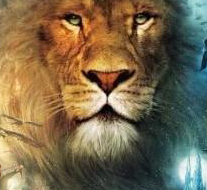 Do you know the books and movies about the magical land of Narnia that is ruled by a lion called Aslan? 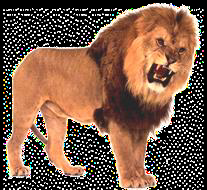 The maker of Narnia is Aslan, a lion who has a very similar life to Jesus. In “The Lion the Witch and the Wardrobe” Aslan is killed and comes back to life. He is always helping the children to do the right thing and be kind to each other and to fight for what they think is good and right. The king’s governors were jealous of Daniel because he did better and more honest work than they did. So they persuaded King Darius to punish anyone who prayed to any god – they must only pray to the king. Daniel kept praying as usual. He was arrested and thrown into a pit full of lions. All night God kept him safe. As a result, Darius came to believe in God and worship him. Previous Previous post: Stress – How to find lasting relief? Next Next post: Despair – How to conjure up hope?